Participants in the Karen Tobacco-Free program have finished up the first five-week course that educates them on the harmful effects of tobacco use. The class consisted of both tobacco users and those who had family that used. Many of the students said they hope to share what they learned within their community. The course was similar to any high school health class, where students learned what is in tobacco products, how nicotine is addictive, peer pressure and tobacco use, why people use tobacco products and steps to quitting. Many Karen people begin using tobacco products at a young age. In their native country, Myanmar (also known as Burma), they lived in the jungle or in refugee camps where there were no regulations restricting young children from smoking and no programs educating the populace on the detrimental side effects of tobacco products. Without these regulations, many children copied the habits of their parents and started using tobacco products. 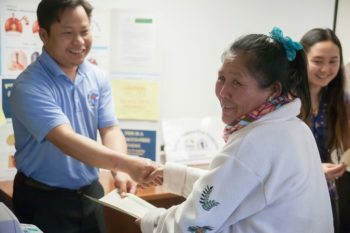 The new program is a partnership between the Karen Organization of Minnesota and Wellshare International with funding provided by the Center for Prevention at Blue Cross and Blue Shield of Minnesota. Tha Da Loo said daily life in the Twin Cities is very different from what the Karen elders experienced in their home country. Back in Myanmar, there was “a lot of war and a lot of fleeing for the adults … so they have never gotten a chance to [attend] school. All they know throughout their life is fleeing and farming,” she said. One of the challenges Ner Mu and Loo find as they teach the classes is that, in addition to having limited English skills, many of the adults do not know how to read the Karen languages or write Karen script. So Mu and Loo take turns reading test questions aloud and recording the Karen adults’ answers. In addition to the classes for grownups, Mu and Loo are teaching after-school classes geared for young people at Harding and Humboldt high schools. The content of the youth classes is similar to the adult tobacco-awareness classes. Humboldt’s classes include information about alcohol use as well and are 12 weeks, while Harding’s last six weeks. Ner Mu and Loo said they often, in both the youth and adult classes, are asked why tobacco is easily accessible in the United States if it is so dangerous. From left to right, Ner Mu, Eugenia Canaan, Eh Tah Khu (co-executive director of Karen Organization of Minnesota), and Tha Da Loo all helped create, teach and host the course. On the last day of class, Mu and Loo had the adults share what they have learned and what steps they will be taking next. Many of the adults said they were not tobacco users themselves, but were concerned about their children, family and friends who use the highly addictive products. Dah Dah Mu, 50, who has lived in Minnesota for over a year, said she enrolled in the class because her son, who is 27, has been using chewing tobacco for about three years. She said, through the help of Ner Mu’s interpretation, that after taking class, she will be advising her son on the negative side effects of tobacco and how it can harm his family as well. Dah Dah Mu said she will use the information from the class to educate and advise her neighbors and friends who use tobacco about the dangers and where they can go to get help to break their nicotine addiction. “I hope that the Karen Organization and the program will grow and spread more information to the community and the other people from Burma, not just the Karen people,” Dah Dah Mu said. Eh Lay, who is 58, has lived in Minnesota for five years. Lay said he decided to take the class because it was the first of its kind, and he wanted to share what he learned with others. He said he hopes the class will help spread the word about tobacco in the Karen community and to other refugees from Burma. “This class is very important and useful for the Karen people,” said Lay, thanking the staff at Karen Organization of Minnesota and Wellshare for sponsoring it. Marjorie Otto can be reached at 651-748-7816 or at eastside@lillienews.com. Follow her on Twitter at @EastSideM_Otto.